When it comes to Japanese cuisine few dishes are more recognizable and beloved than ramen, and these Japanese Ceramic Ramen Bowls Set for Six is the best way to serve the delicious noodle soup. Yet, these Japanese bowls are made from high quality earthenware and finished in excellent glaze, for a bowl that can be used for noodle soup, pasta, rice with vegetables or meat, udon, or donburi for years to come. When it comes to uses for this larger bowl, there are endless options. Versatility is simply one outstanding quality of these Japanese Ceramic Ramen Bowls. The bright cherry blossom designs, found on the interior and exterior of each bowl, are carefully composed and perfectly balanced. Inside is a wavy, backdrop of alternating plaid and solid blue. A number of cheerful cherry blossoms dance across this background. 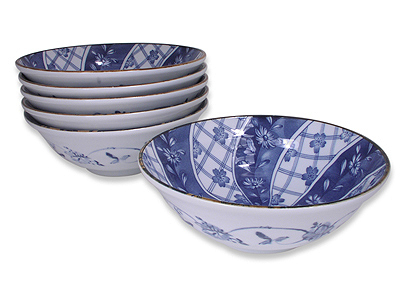 It is a traditional design that delineates the Blooming Blue and White Cherry Blossom Dinnerware Set. On the exterior, partially open cherry blossoms are connected to a hazy branch. These substantial 8" Japanese Ceramic Ramen Bowls, shipped direct from Mrs. Lin’s Kitchen make a great gift, as do the smaller Japanese Ceramic Bowls Set for Six. The entire set arrives artfully wrapped in a paper box and ready for delivery to your special someone. Let them know that these Asian bowls are incredibly functional, as they are dishwasher and microwave safe.